Runtime: 2 hr. 10 mins. Fathom Events and Shout! Factory have joined forces to bring What We Left Behind: Looking Back at Star Trek: Deep Space 9 to theatres for one night. Deep Space Nine is described as "dark," "edgy," and "the black sheep" of the Star Trek family - a show that did not fit in Gene Roddenberry's vision of the future. 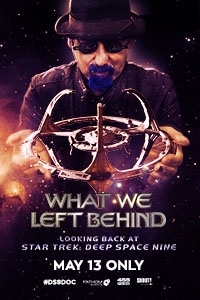 Through interviews with cast and creators, show footage presented in HD for the first time, and brand-new animated storyboards showing what could have been directors Ira Steven Behr and David Zappone bring you What We Left Behind: Looking Back at Star Trek: Deep Space Nine, an in-depth look at this beloved show, its fans, and its ongoing appeal to Trekkers of all ages.